Released in October 2014, Olari Elts’ latest recording by the Ondine label has received critical acclaim. 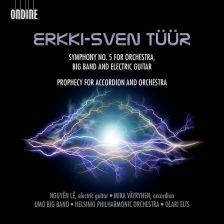 ‘Superbly performed, recorded and annotated’ as the Gramophone magazine reviewed, this recording with the Helsinki Philharmonic Orchestra comprises of fellow Estonian composer Erkki-Scen Tüür’s Symphony No. 5 for Big Band, Electric Guitar and Symphony Orchestra, as well as Prophecy for Accordion and Orchestra.